I meant to upload this a few weeks ago, but this is the promo brochure and poster for a Men's Retreat I did recently. 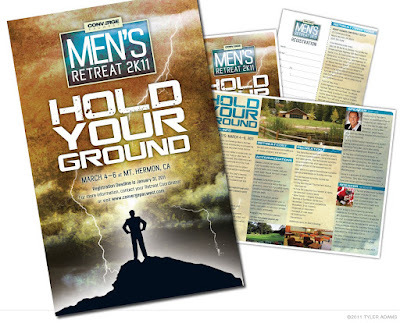 Originally, the theme for the retreat was "Stand Firm". I proposed that they change the name to something a little different since the "Stand Firm" idea (at least to me) seems to be a bit overused for men's gatherings. I pitched "Hold Your Ground" because it was a different way of saying the same thing. The idea is that if Jesus is the Rock you're standing on, than you can hold on to Him during the storms of life. They ran with the theme, and I ran with the design.